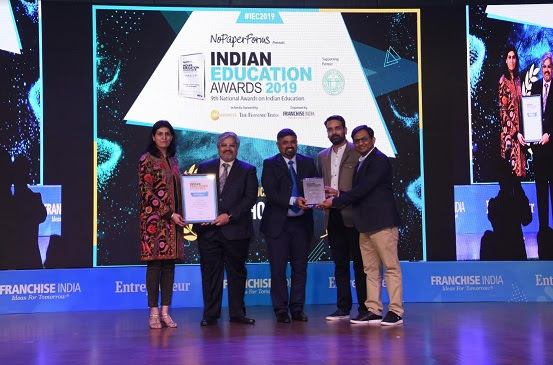 Bengaluru: Manipal ProLearn, a leading professional learning platform and a division of Manipal Global Education Services (MaGE), has been recognized as the “Best Corporate Training Programme” at the 9th Indian Education Congress & Awards 2019 at a recently held ceremony. Manipal ProLearn was awarded in the “Service Provider Awards” category under the “Best Corporate Training Programme” sub category. The Application highlighted the value Manipal ProLearn offers to its clients through portfolio of programs, pedagogy, and process framework that makes it stand-out in the industry. Indian Education Congress & Awards organized by Franchise India brings forth industry veterans to interact and draw attention on future readiness. It helps educationists, EdTech innovators, investors, policymakers and academicians to come together and drive discussions on how education practices in the changing society can be transformed by investigating ways to build education ventures, school partnership models, support edupreneurs, and work with new ideas and innovations across the K-12, Higher learning & Professional Learning ecosystem.